Here at Created by Magic, we aim to keep our customers happy, please feel free to contact us about any questions you may have and we’ll get back to you as soon as possible. We appreciate you may just want a quick answer now, please select from the boxes below and hopefully that will answer your query. Launching in August 2015, Created by Magic is the UK’s premium handcrafted online marketplace for baby and children gifts. 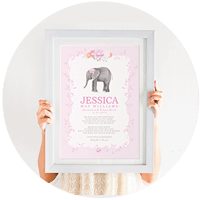 Each seller specialises in their own specific category, oozes class and encourages young imaginations. You can learn what personal information createdbymagic.com collects and uses about you when you access, browse and use this website and see what rights you have to control our use of your personal information. All our delivery options and prices explained. International delivery is also available, please enquire by sending us an email enquiry.